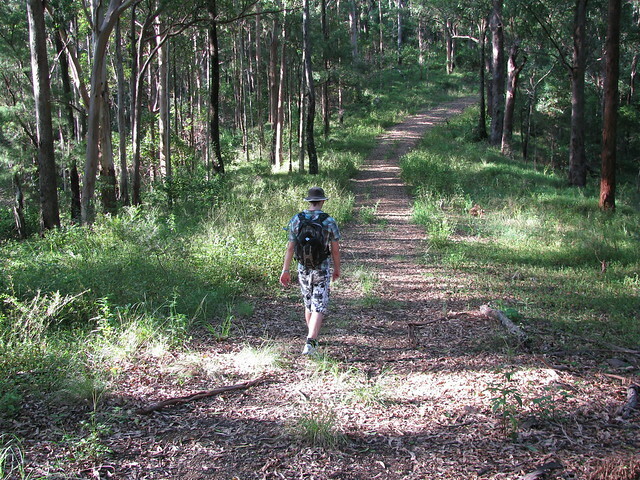 Lachlan and I took a long 25km hike through D’Aguilar National Park yesterday. This is the toughest walk either of us have ever done. The track included over 1,100 metres of vertical ascent and some hair-raising scrambles over washed out roads, but the experience was worth the effort. 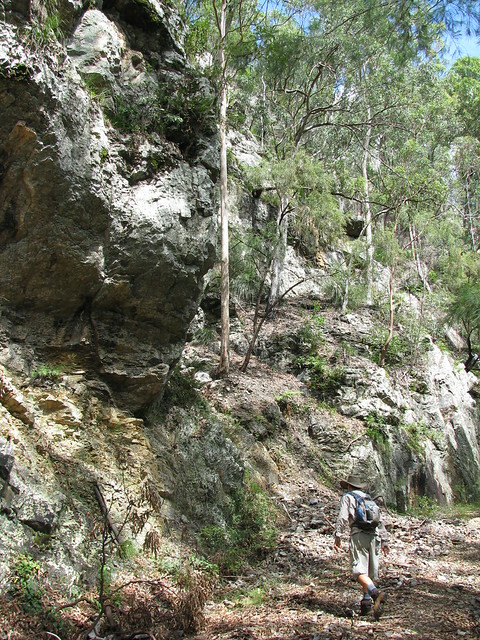 We started on the Westside Track across the road from “Maiala” at Mount Glorious and headed north towards Lawton Road. After a couple of kilometres we had to stop and pick off dozens of leeches from our shoes and socks. I was really glad that I had covered my ankles and socks with insect repellent beforehand. 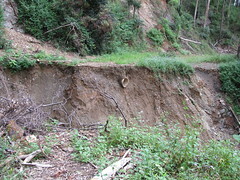 Recent rain has washed away parts of Lawton Road. 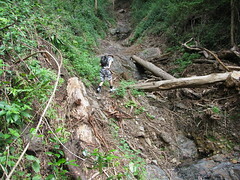 Most of the time it’s easy to walk around the washouts, but in a couple of places we had to scramble over ravines to get from one side of the road to the other. 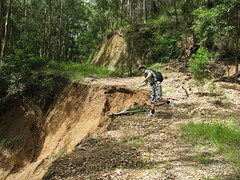 The problem is compounded by the steep drop-off on one side of the road, and steep cliffs on the other side, which make it difficult to find a safe place to cross. 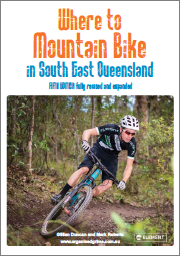 One thing’s for sure, we would never have been able to take a mountain bike over a couple of these wash-outs! 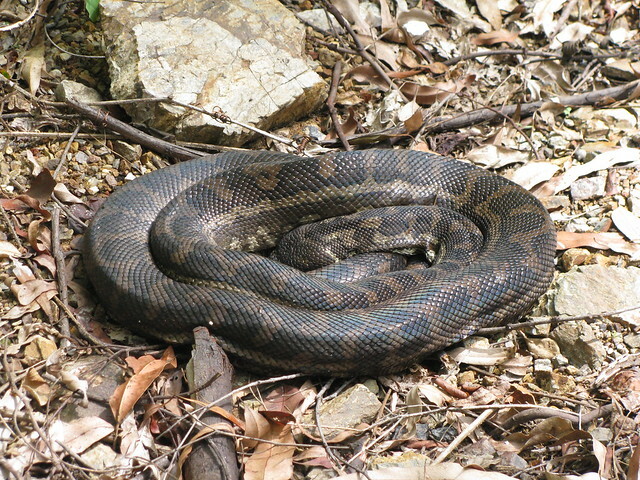 A Carpet Python sleeps in the afternoon sun in the middle of the road. Apparently snakes don’t understand road safety guidelines. 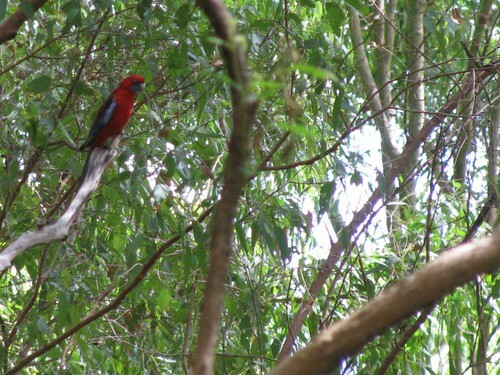 We saw dozens of these striking Crimson Rosellas (Platycercus elegans) along the way. Unfortunately they’re quite shy, so it was impossible to get close enough to get a decent photo. Lawton Road winds slowly westwards up Northbrook Mountain. I felt dwarfed by these huge boulders which over-hang the road. From the end of Lawton Road we headed south along England Creek Road. 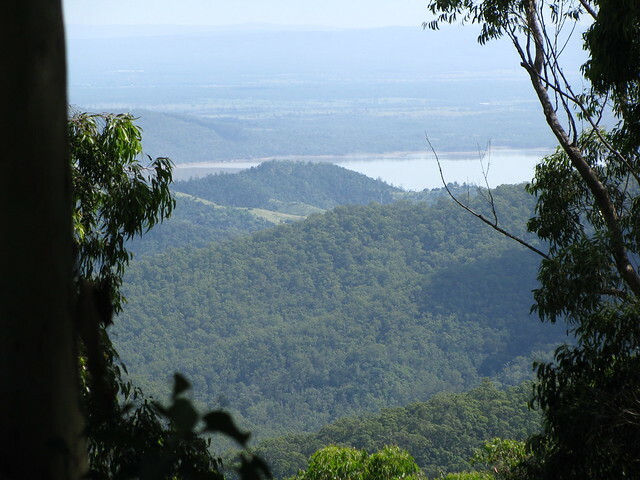 This is the view westward towards Wivenhoe Dam. The road follows a long southward ridge down from the heights of Northbrook Mountain to the valley below. There are great views east and west of the ridge line. 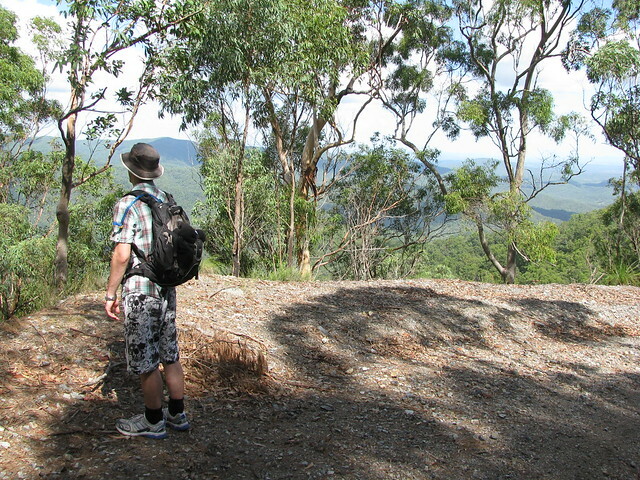 Lachlan takes a quick break to take in the view looking east from England Creek Road. 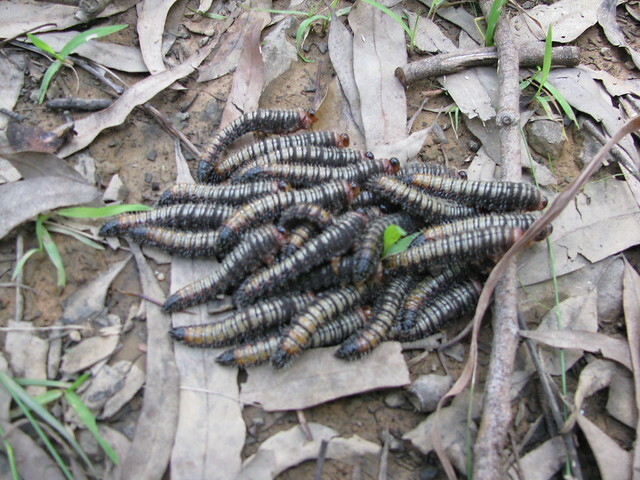 These caterpillars were clambering over each other forming a strange squirming heap which didn’t appear to be going anywhere. 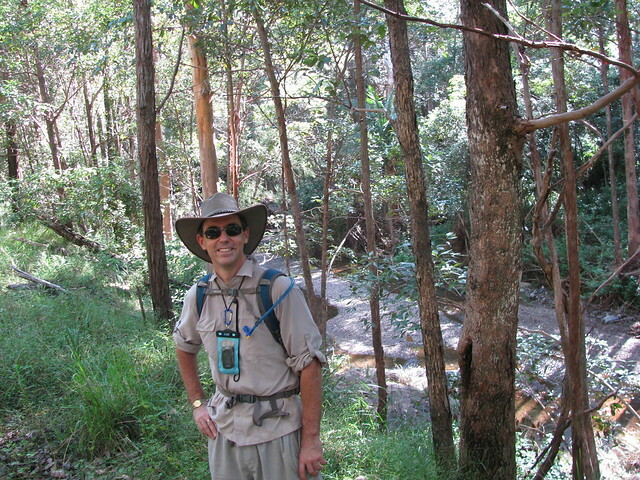 Eventually we reached the bottom of the ridge line and crossed England Creek which flows west to Fernvale where it eventually joins the Brisbane River. This was the about the lowest elevation of our hike, and the creek here is pretty – clear water, gravely banks, and lots of small cascades as the water splashes over the rocks. 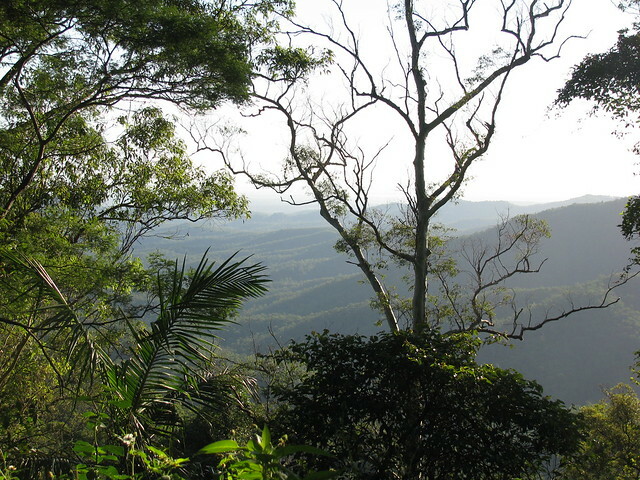 After walking 18km, we started the final 7km up-hill trek up Joyners Ridge Road. For me, this was the most physically demanding part of the walk. I was in pain most of the way, and could hardly walk by the time I reached the top. Some of the views from Joyner’s Ridge Road are stunning. Here’s a view westwards as the sun was starting to go down. 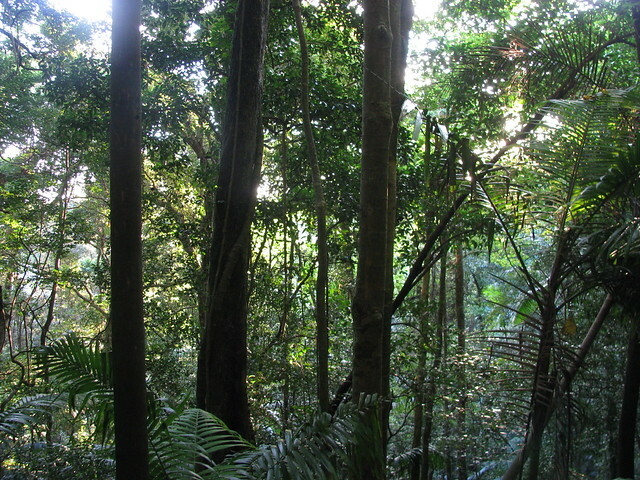 After the long climb back up, we eventually made it back into the rain forest. Full of Strangler Figs, Blackbean and Piccabean Palms, this place is magical as the sun is going down. The pain in my knees and hips was intense, but it didn’t matter – we were in paradise.